Friso Mommies Arm Their Kids! Mothers are spoilt for choice in Growing-up Milk category. Against a clutter of aggressive pharma brands with strong medical claims, Friso Gold with its small budget had a tough challenge in holding affluent moms engaged around its immunity platform. Working moms often worry about their kids’ health & safety, especially when they’re at work. Being guardian angels to their children they want nothing more than equipping their children with total defense mechanism. Recognizing that working mothers often have pockets of me-time in between office hours, which they spend online uploading, playing and sharing photos, we invited them to do what’s top-of-their-mind – arm their tiny tots with total safety! – via a cool custom Photo tool. 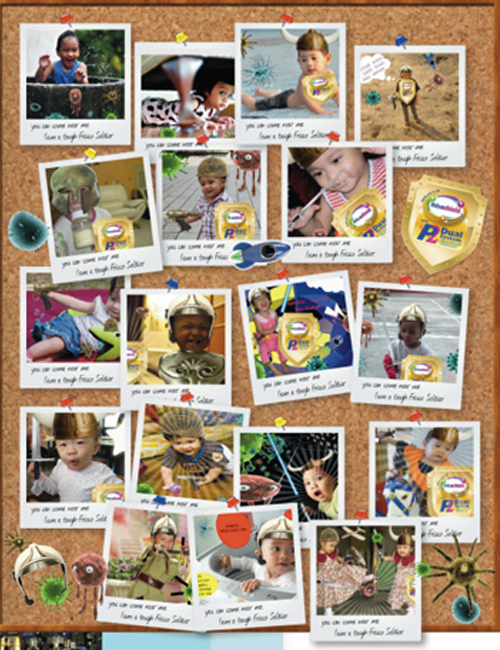 We invited a group of alpha-moms to use the photo tool to choose from an array of weapons, shields, armors etc to creatively showcase their kids in the midst of battling bacteria & germs, along with a photo blog entry that turned them into Friso Gold’s advocates & opinion leaders. Friso Gold’s association with immunity was further reinforced via information sharing during parenting talks & kids activities held exclusively for winners of most interesting entries. The brand attribute related to immunity grew by phenomenal 150% over the quarter! On the shelves, sales recorded a healthy growth of 9% over previous quarter and 23% over last year (Nielsen Retail Audit; Dutch Lady Brandtrack). The travel category in the search sphere is one of the most active as more consumers turn online to research, compare and purchase travel solutions. In this complex cross borders environment, Malaysia Airlines (MAS) was not at ‘top of page’ and top of mind. Recognising the increasing importance of search in gaining market share, we embarked on one of the most comprehensive Search strategies ever undertaken in the sector, covering 25 markets and 10 languages and all managed centrally from Malaysia. We launched three simultaneous strategies. 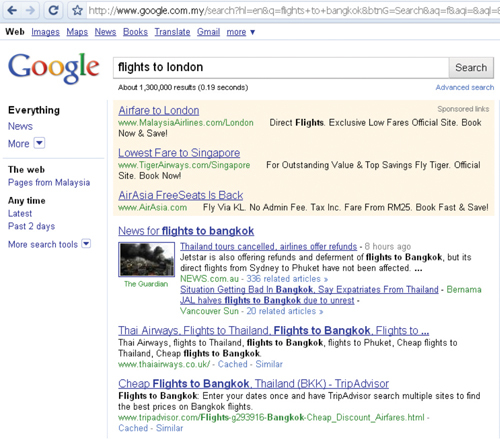 Firstly, to connect with in-market consumers actively searching for ‘travel’. Secondly, we tracked consumer interactions with search words straight through to conversions. Thirdly, we managed MAS image and reputation by including brand search. We conceived a robust campaign structure where relevant ads highlighting fares and products for destination and origin cities were assigned to each keyword group. The final set up included over 1,000,000 keywords and 50,000 ad copies. We adopted an intuitive web based Search Engine Marketing (SEM) software designed exclusively for managing, measuring and optimizing all forms of search traffic. More importantly, we tracked and optimised keywords direct to MAS’s bottom line profits. Ticket sales sold through global search engine origins alone increased by 450%. Visitor website volume improved through creative copy optimization. 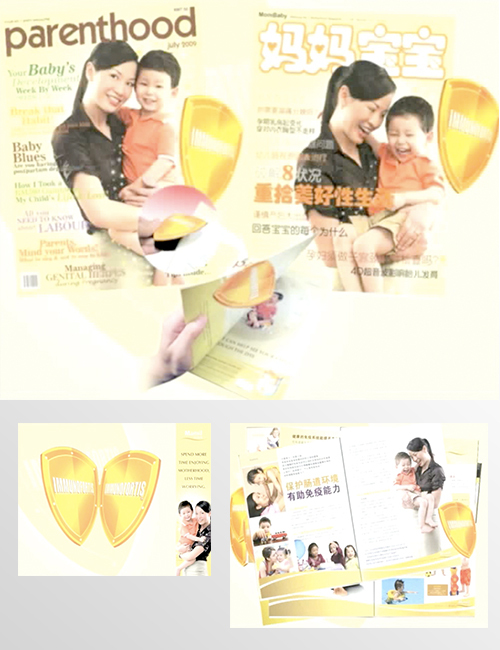 The campaign beat its closest competitor to win Gold at the Asia Pacific Digital Media Awards 2009. 2009 Visa spends 130% of MasterCard, with intension to dominate share of wallet during high spending period i.e Mega Sale. Visa has been known to deploy ambush tactic during this period. The challenge was to help MasterCard to defend against competition, break-the-clutter & create buzz during Mega Sale. Credit card – “first-out-of-wallet” is the most important driver of spending. 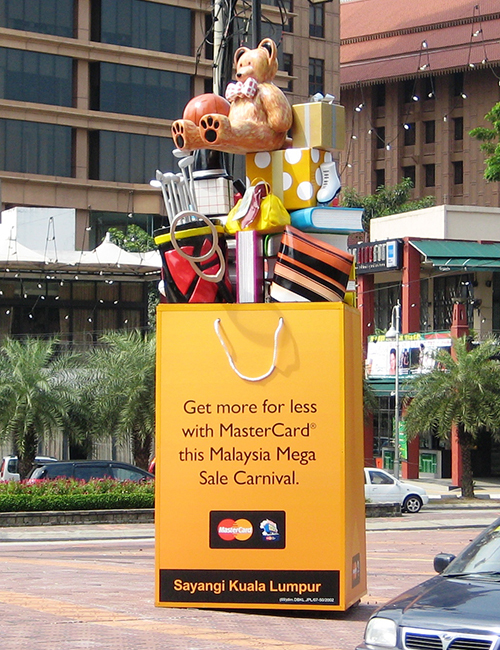 MasterCard dominance the last mile through various OOH points within key shopping district in Klang Valley. SHOPPING BAG IS THE BEST REMINDER FOR “FIRST-OUT-WALLET”. We trigger the pleasure of shopping over-flowing via creating giant shopping bags icon that filled with goodies and placed at the busiest shopping district in town. MasterCard giant shopping bags icons were placed at strategic high traffic and busiest corner of Pavilion and Lot 10. The icons became an instant shopping landmark at the heart of the Golden Triangle, throughout the Mega Sale period. In the year of recession with high competition from VISA and a budget cut of 50%, MasterCard still managed to record an amazing growth of 2%, compared to MMSC 2008. The new MILO Fuze formula has more MILO taste. We need to tell urban adults that MILO Fuze is now ‘jam-packed’ with more MILO taste! How can we serve a creative, content based solution that engages and impacts the target? Research reveals that urban adults are somewhat rebellious and do not like taking “instructions” from advertisers. However, word-of-mouth and slapstick humour resonate well with them. With this insight, we engaged popular TV hosts with a loyal fanbase amongst our target. These TV hosts did not just talk about the new, jam-packed MILO Fuze taste, they also acted out the ‘jam-packed’ experience in a fun, exaggerated and slapstick manner! For the first time ever, we ‘jam-packed’ 8TV’s studio with a group of people during 8TV’s Quickie talk show! Viewers became curious, since normally the show only has two hosts. The hosts raved continuously about MILO Fuze’s new formula with MORE MILO taste, linking the ‘jam-packed’ studio with MILO Fuze’s ‘jam-packed’ taste. A contest on Quickie strengthened connection, where viewers could call in and answer questions about the improved formula. 98% polled that the campaign created positive brand appeal. Trial of MILO Fuze increased by 4% within the first month of the campaign (Millward Brown). Quickie’s viewership soared to its highest record during our campaign month! It was such a success that we replicated the campaign in another talk show.